Woods prepares to putt at Farmers Insurance Open. (Getty Images). It’s been, in the phrase he almost copyrighted, a process. Back playing (remember when that was a serious question? ), then back contending, back sticking three or four good rounds together, back winning and now back at world No. 1. But underpinning everything at the Arnold Palmer Invitational tournament at Bay Hill, Tiger was back putting like the best player on the planet. Not how, but how many, runs the truism. Yet both sides of that oft-coined phrase hold the answer to Tiger’s return to the top. First the “how.” His (official PGA Tour) statistics in the Arnold Palmer tell a clear story. Only joint 71st in driving accuracy, 49th in distance, 34th in greens in regulation - yet first in strokes gained through putting. And it’s part of a developing pattern. His WGC Cadillac win at Doral earlier this month saw him take just 100 putts over the four rounds - the lowest number of his entire career. Just as startling is the Tour stat that in his eight rounds of golf at Doral and Bay Hill, Tiger did not miss a single putt from within 10 feet. Another vignette highlights just how putting both feeds on, and breeds, belief. 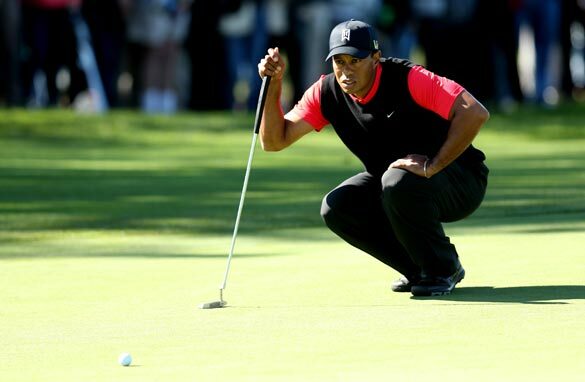 Tiger had bogeyed the last three holes in round two and as he stood on the first green in the third round he faced a 13-foot putt to save par. It never looked anywhere but in. He stalked after it as it dropped and went on to make a number of further, critical, par-saving putts, before turning up the heat with an eagle and birdies to take the lead. At his peak, Tiger always seemed able to sink those long putts to save par when he really needed it. Well he’s back on that form, and there’s nothing quite like nigh-on impregnable putting to pile the pressure on the challenging pack. When Tiger spoke to Living Golf a few months in to his time with coach Sean Foley, he told us he wanted to groove the same swing through the bag. He just needed the “reps” to get there. That concentration on changing the “how” had the inevitable effect of sidelining the feel aspect of those vital chips and pitches, the fundamental aim of getting the ball as near as possible to the pin. It wasn’t unusual at that time to see an 80-yard wedge fly 20 yards past the pin, or fall 20 yards short. Well now he’s stopped talking about the process, the reps, the grooving. And the effects are there for all to see. Not just in some top-class approach play, but also in a more calculated view of what it takes to get the job done around the green. He’s got past the stage of having to think how, just how many. And so to Augusta. History suggests that Tiger winning three tournaments ahead of the Masters is no guarantee of success there. He’s been in this position three times before - and three times he’s not emerged with the crown. But after a few days rest in Florida he’ll go in search of a fifth green jacket full of confidence. He told reporters after his Bay Hill victory that it’s years since he felt so good approaching Augusta. Monday's win at Bay Hill ensured Tiger’s now tied Sam Snead’s record of eight victories in a single event; he’s only five behind Snead’s all-time PGA record of 82 wins (and five of Snead’s victories came in team events); and he’s regained that world No. 1 spot. More to the point, he’s back winning big tournaments even when not at his very best. And as for the view that Tiger will only really be back if and when he wins another major and closes on Nicklaus’s record of 18? Fair enough, but a first major victory since his U.S. Open in 2008 wouldn’t half close the circle, and put a lid on one of the most repeated questions in golf. And if the final answer does come at Augusta, it will be thanks to that hottest putter in the game. Really? Putting is the key to success in golf, professional, amature or otherwise? The Secret??? The New Blonde lady, this guy loves the blondes. "Lindsey Vonn Key to Tiger's Revival"
i don't like him then and still don't like him now. When Tiger's luck on the greens slows down he won't win. Rose would have won by a good margin if some of his short putts fell into the hole. I would take the field against Tiger at the Masters, where greens are more difficult. Tiger is obviosly playing well.He understands golf holes like none other.Whenever he sees a golf hole his instincts peak to their maximum. Erin must be salivating on the millions that Tiger could win! Everyone deserves a second chance. No one is perfect. I am glad that Tiger, again is "walking tall" in a new way. I love the game of golf and all of the players.